Trudel, Marcel and Mathieu D'avignon. "Samuel de Champlain". The Canadian Encyclopedia, 10 December 2018, Historica Canada. https://www.thecanadianencyclopedia.ca/en/article/samuel-de-champlain. Accessed 23 April 2019. On 30 July 1609, armed with his harquebus, Champlain killed three Mohawk chiefs. The battle ensured the enmity of the Iroquois Confederacy. Champlain's drawing is fanciful in detail (courtesy Library and Archives Canada/C-5750). 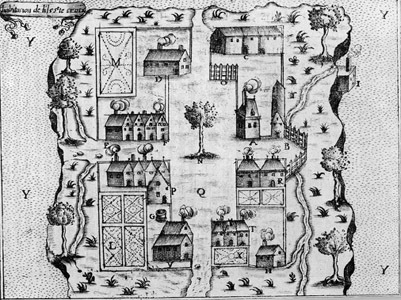 The Habitation at Saint-Croix, in present-day Maine, was the second European settlement north of Florida, after Fagundes in Ingonish (drawing by Champlain/NAC). 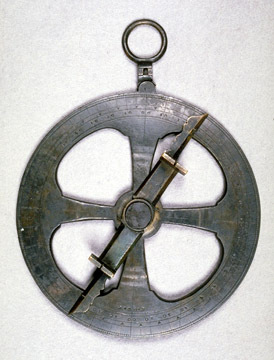 Champlain's astrolabe (courtesy Canadian Museum of Civilization). Samuel de Champlain, cartographer, explorer, colonial administrator (born circa 1567 in Brouage, France; died 25 December 1635 in Québec City). Champlain played a major role in founding New France from 1603 to 1635. He explored the Atlantic coastline (in Acadia), the Canadian interior and the Great Lakes region, and established friendly relations with the Aboriginal enemies of the Iroquois. Champlain participated in the foundation of French colonies in Acadia, at Québec and at Trois-Rivières. For many years, he remained the chief person responsible for administrating the colony of Québec. Champlain published four books as well as several maps of North America. There is no authentic portrait of Champlain and little is known about his family background or youth. He may have been baptized a Protestant. It is certain, however, that he was a Catholic as of 1603. He may have made a voyage to the West Indies around 1600; though the account of these voyages, Bref Discours, is attributed to him, he himself never referred to it. When his career in Canada began in 1603, on a voyage up the St Lawrence with François Gravé du Pont, he still held no official title. He published an account of this voyage, the first detailed description of the St Lawrence since Jacques Cartier's explorations. 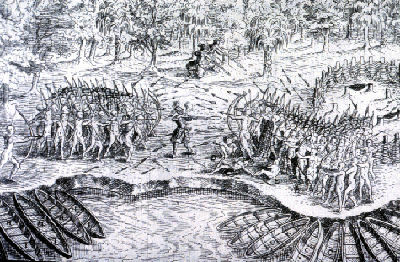 Since Cartier’s voyages, the Algonquians had taken over the area from the Iroquoians. At Tadoussac and other locations in the Laurentian Valley, the French had contact primarily with the Montagnais, Algonquin, Malecite and Micmac peoples. In 1604 Champlain sailed to Acadia with Pierre Dugua de Mons, who planned to establish a French colony there. Champlain had no position of command at either of the Acadian settlements at Ste-Croix or Port-Royal (Annapolis Royal, NS). As a cartographer, he was given responsibility for investigating the coast in search of an ideal location for settlement. He was also required to act as diplomat in dealings with the Aboriginal peoples that Dugua wanted to get to know better. Twice, in 1605 and 1606, he explored the coastline of what is now New England, going as far south as Cape Cod. 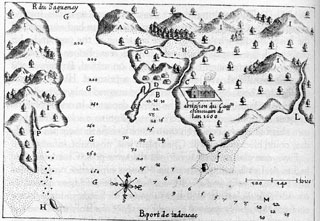 In 1608, Dugua chose the St Lawrence over Acadia and sent Champlain to establish a settlement at Québec, where the fur trade with native peoples in the interior could be controlled more easily. Champlain developed a vast trade network by forming and consolidating alliances with the Montagnais of the St Lawrence, the nations on the Ottawa River and the Hurons of the Great Lakes. This system obliged him to support his allies in their wars against the Iroquois, whose territory was to the south of Lake Ontario and into the state of New York. He participated in military campaigns in 1609 (on Lake Champlain), in 1610 (near Sorel) and in 1615 (in Iroquois territory). 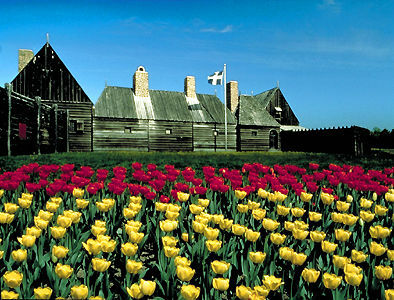 Injured during the third expedition, he was forced to spend the winter of 1615—16 in Huronia. He took advantage of this time to explore the Lake Huron region and develop cordial relations with new nations, notably the Odawa and the Nipissing. Despite opposition from the various merchant companies that employed him and found it more profitable to be involved only in the fur trade, Champlain vowed to make Québec the centre of a powerful colony. In a 1618 report, he outlined its commercial, industrial and agricultural opportunities. His dream seemed about to come true in 1627 when the Compagnie des Cent-Associés was founded. By the following year, however, the Kirke brothers had taken over Tadoussac, Cap Tourmente, and Québec in the name of the English Crown. The capital of the fledgling colony of New France was occupied by the English from 1629 until 1632, when it was returned to the French. 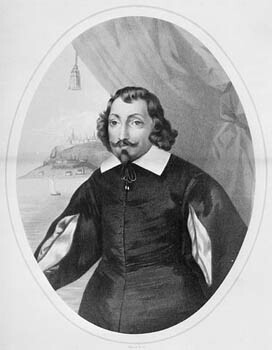 Appointed lieutenant by Cardinal Richelieu, Champlain returned in 1633 to Québec, where he had time to see the promising beginnings of the colony he had planned. Paralyzed in the fall of 1635, he died the following December. His remains, buried under the Champlain chapel which adjoined Notre-Dame-de-la-Recouvrance, may today lie under the cathedral basilica, Notre-Dame de Québec. Champlain left behind a considerable body of writing, largely relating to his voyages. The most important editions of his work are the ones prepared by C.H. Laverdière (1870) and the bilingual edition of H.P. Biggar (1922—36). Champlain's works are the only account of the Laurentian colony at the beginning of the 17th century. As a geographer and "artist" (as a factum states), he illustrated his accounts with numerous maps, of which the most important and the last was that of 1632. It includes a list of place names not found on the map as well as unpublished explanations and it presents everything known about North America at that time. See also Champlain and the Founding of Québec. David Hackett Fischer, Champlain’s Dream (2009). The works of Samuel de ChamplainSee a digitized copy of the book “The works of Samuel de Champlain” from archive.org. Champlain: Peacemaker and Explorer Check out the book Champlain: Peacemaker and Explorer at the Indigo website. Exploring the Explorers: Samuel de ChamplainTeacher guide for multidisciplinary student investigations into the life of explorer Samuel de Champlain and his role in Canadian history. From the Dictionary of Canadian Biography. Samuel de ChamplainFollow the 17th century explorations of Samuel de Champlain in the multimedia Virtual Museum of New France website.